Modern machines are combination of latest hardware and advanced software technologies and their performance is measured mainly by the simplicity of use and capability to undertake complex tasks. 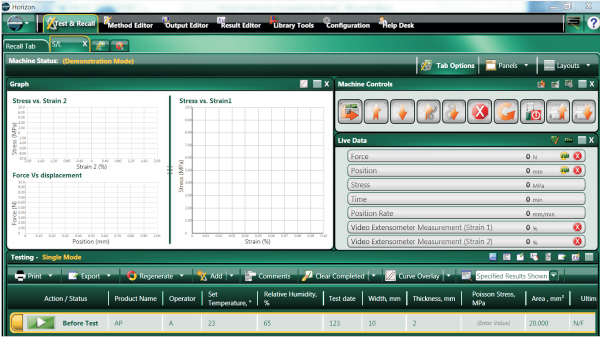 Horizon software combined with Tinius Olsen UTMs or Impact Testers or Torsion Testers or MFIs or HDT/Vicat Testers; allows customization in user preferences, test parameters, test sequences, graphical representation, data management, post test analysis, report generation etc. RTP4000 true average power sensors provide 80 dB dynamic range and a frequency range down to 6 kHz. Built with Boonton's Real-Time Power ProcessingTM these sensors deliver 100,000 measurements per second, no gaps in signal acquisition and zero measurement latency. Combining this performance with pulse profiling, capture and measure of pulsed, CW and modulated signals, multi-channel capabilities and documentation tools RTP4000 average power sensors are the ideal instrument for fast, accurate and reliable RF power measurements.